In 2012, we moved from California to Utah. Bertie and Mercedes took being packed in the back of the van fine, even though as their 4 foot long and 2 foot wide cage was encircled by a myriad of other essentials that had to be transported simultaneously. Fargo, on the other hand, couldn't make up his mind if he wanted to sit on the front seat in a harness or wander the van, complaining as he went. After about 70 miles of this, it was decided that he would remain in his carrier, behind the front seat, and just come out for food and potty breaks. In the end, the animals weathered the trip better than the humans, who had a lot of setting up and arranging to do. Though the area we moved to has hay growing all around, we found the best hay ever(!) online from Sierra Valley Hay in California. The ordering was fast, the turnaround time usually 2 day, and the shipping was included in the price. Bert and Mercedes were especially fond of the oat hay, which always had that "new hay" smell. Fargo was happy that a PetSmart was nearby, or other items were easily ordered from wag.com, again usually with a 2-day turnaround. Possum, in the tunnel, and Snickers were adopted from 4 Paws sanctuary at a Pet Smart adoption event. 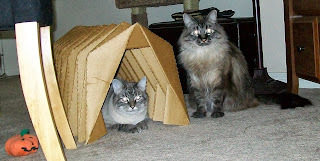 Though they look very similar, Possum is a short haired Siamese mix, and Snickers is a long haired Siamese mix. At 3 and 5 years of age, they keep Fargo, now about 13, on his toes, and most of the time he seems to not mind having them around and even plays with them on occasion, something he never did with our other cats. They got along well with Bertie and Mercedes: Possum got into their exercise pen on a couple of occasions and was promptly ignored, and Snickers was fascinated by their hay, and took every opportunity to snag a piece. Bertie and Mercedes came to live with us in 2004. Mercedes was born in January 2004, and adopted by us later in the year from the Sacramento House Rabbit Sanctuary. Bertie we got later that year as a companion for her, from the veterinary hospital on whose doorstep he had been left: we always thought that he had been someone's Easter bunny. We had good times with the buns and they seemed to enjoy life with each other and having human slaves and various cats to boss around. 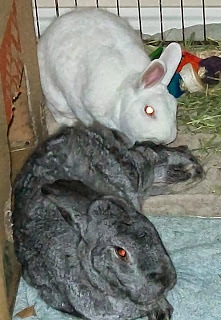 Bertie left us on February 13, 2013, and Mercedes held on until September 4, 2013. We miss them wholeheartedly and deeply. As you may have guessed, this concludes this blog. Thank you all for your kind words over the years. Your posts have (and will) be missed, although it's good to know that all has been well for you for the most part. So very sorry to hear about Bertie and Mercedes--Mr. Mick and I will be sending some special thoughts out to them. Congrats on the new family members--I'm sure they'll keep you and Fargo very busy. I'm very sorry to read about Bertie and Mercedes, I know they had a wonderful life with you. I wish you all the best in whatever comes next. Nose rubs and nose bonks to all your new and current furry family members. Sorry to hear that Bertie and Mercedes have crossed the bridge. They were a fine pair. Good luck to you in your new home. Very good to hear from you, but sorry to hear about Bertie and Mercedes. Comforting to know that Fargo is well and that he has companions. Peace to you. The never ending saga of 2 house rabbits and 1 house cat doomed to live with humans beneath their notice.